Astronomers have long suspected that these remnants of dead stars were the source of type Ia supernovae, but SN 2011fe provides the first direct evidence. A firsthand examination of the light from the supernova also revealed information about the celestial body that once orbited the white dwarf. In a type 1a supernova, material flowing from a second star onto the white dwarf overloads the compact relic and triggers the blast. The companion could be anything from a large red giant star to another white dwarf. When stars explode, a shockwave rushes outward. Collisions with material around it cause the region to flare brightly. 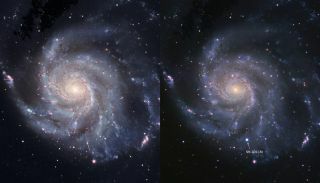 By studying the light from SN 2011fe, Nugent's team was able to rule out specific types of stars as the companion. The neighbor star could not have been a red giant, Nugent explained, because collisions between the debris and a large, massive star would have been very obvious. The resulting light would have been several magnitudes brighter than what was detected. Similarly, a white dwarf companion would have been ripped apart, leaving a debris field for the shockwave to collide with, causing an impact that wasn't seen in the data. "The only thing we were left with was a star not too different from our sun as the companion," Nugent said. In an accompanying paper, Weidong Li of the University of California at Berkeley also sought information about the companion. "There were some very deep images from the Hubble Space Telescope prior to the discovery of this supernova," Li told SPACE.com. Li and his team examined more than a decade's worth of data from NASA's space-based telescope in search of the second star in the pair. But no star was detected, allowing them to place an upper limit on the size of the companion. A red giant, for instance, would have been visible in the images. Ultimately, Li and his team concluded that the companion could be a main sequence or subgiant star, or even another white dwarf. Combined with Nugent's data, this narrows down the identity of the companion star. "A low mass main sequence star is the object most likely, given the two different ways we went about trying to constrain the progenitor," Nugent said. Both papers were published in the Dec. 15 issue of the journal Nature.